Can you believe it’s been a week since Your Life Made Easy launched? I’m over here feeling absolutely blessed with you, dear readers, and your positive feedback. It’s been so-gosh-darn amazing. While it will be awhile before I write another book, it’s always fun to talk a bit behind the scenes of our DIY filled world. But now it’s time to get back into time-saving projects…. Making stencils perfect. Yep, it’s a struggle for me, too. I cannot wait to show you how create a perfectly painted print so you’re next project looks professional. When we lived in Mississippi and Alabama, I found an intense love for all things monogrammed and personalized. And I HAD to bring that southern love to Michigan. So you’ll see pops of stenciling throughout my projects. 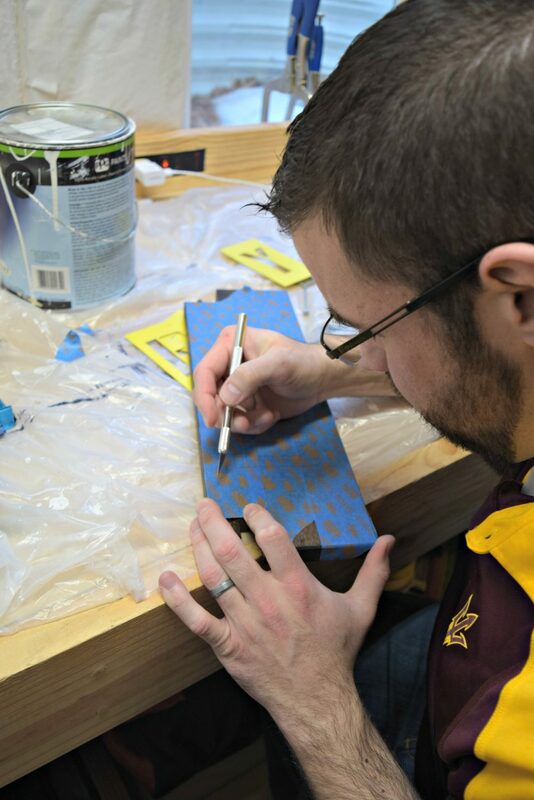 But the hardest part of stenciling is not messing it up! It’s easier to conquer if you have a Silhouette machine. But I don’t have one yet ( 😉 hint, hint 😉 ), so I’ll show you the quick & dirty method. But, thanks to Jordan, we found a perfect and easy solution! First, select your stencil for your project. You want to make sure the spacing is right before you spend time working on something that doesn’t look ‘just right.’ I dislike wasting time on projects and I’d hate for you to do the same, too. 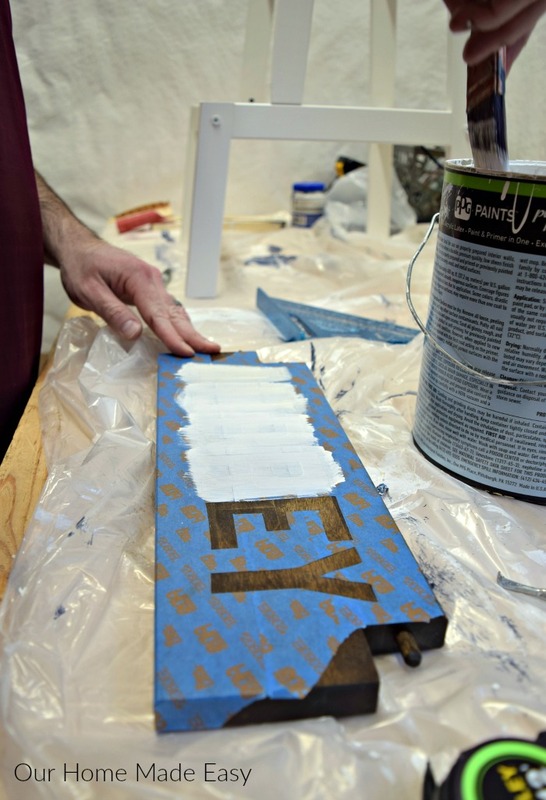 Gather your blue painters tape, a pencil, an X-ACTAO knife and your stencil. 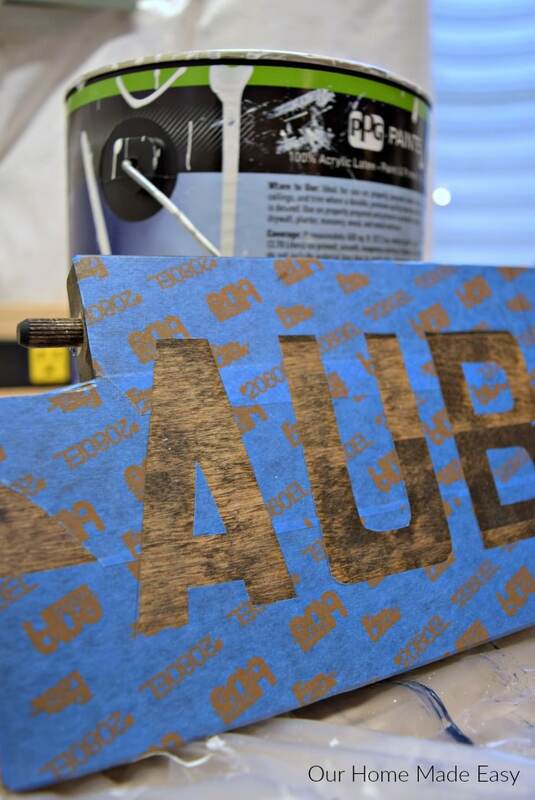 Fill your entire white space of your project with single strips of painter’s tape. Next, lay your stencil over the tape covered area. Using your pencil, trace out your letters. 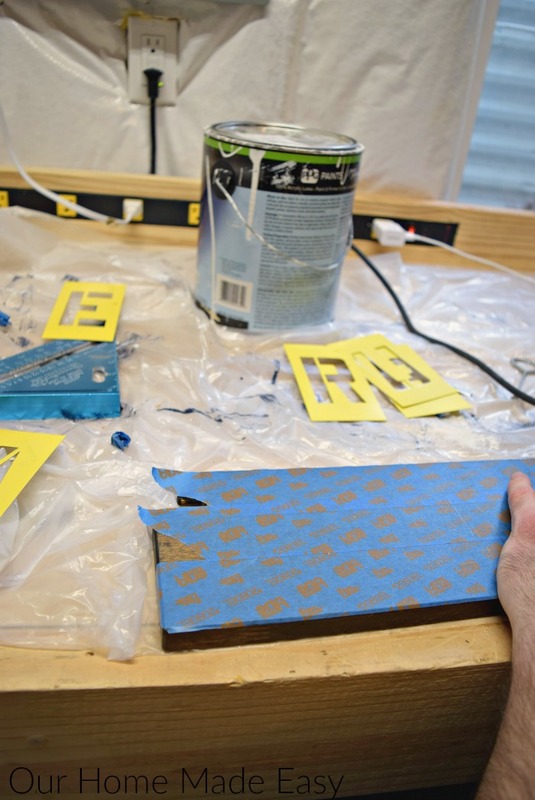 Then, use the Xacto knife to very lightly score the painter’s tape. Peel away the scored tape. Apply your paint to the exposed area. Allow several minutes to dry and peel away the tape. 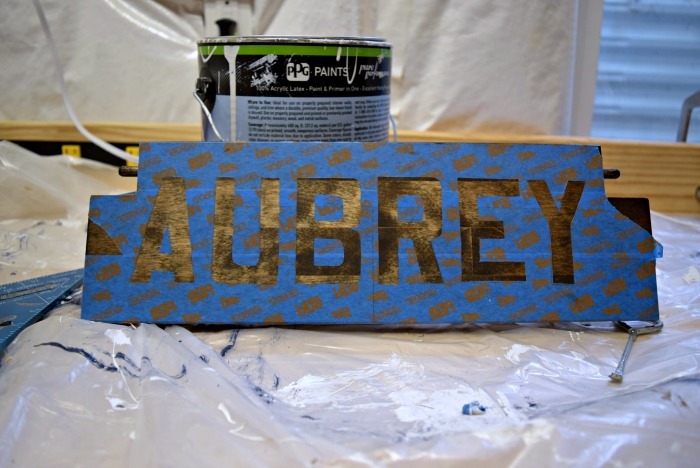 Voila– perfect stenciling without any fancy equipment! Top off your project with a coat of polycryclic. My favorite finish is matte. It will protect your project but without leaving a high-shine finish! 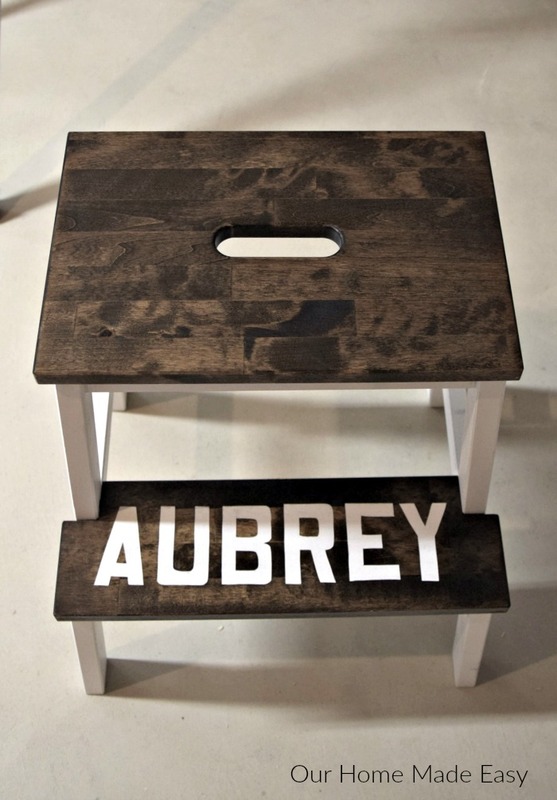 You can see that with some easy tools you can create perfectly stenciled letters! Now you don’t have to worry about paint smear or annoying smudges. It’s such an easy way to personalize an item and super budget friendly! « Your Life Made Easy is Here! These are really great instructions – I’d love to have you share it at the Pleasures of the NW’s DIY Party!